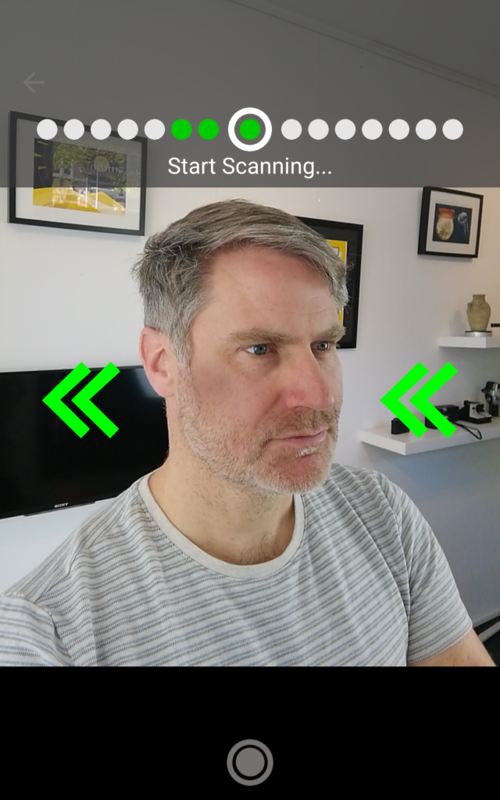 Three weeks ago I posted that Bellus3D has brought their face scanning app to the iPhone X, using its internal depth sensor. 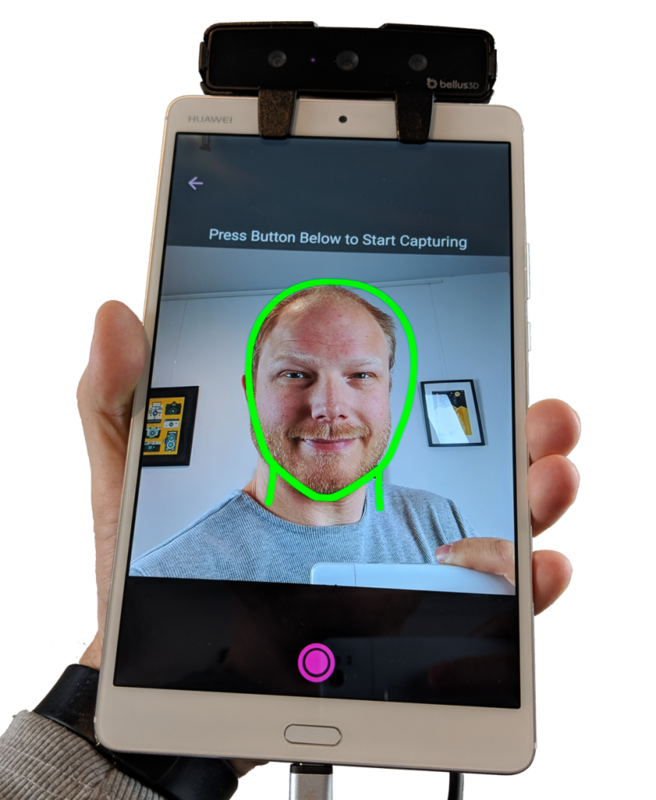 I’ve yet to get my hands on an iPhone X to actually test that but I did receive the company’s external Face Camera Pro sensor that can similar face scanning abilities to Android smartphones and tablets. Warning: since this is a basically a 3D selfie device, this posts will contain a lot of selfies of yours truly. Don’t say I didn’t warn you. The clip-on bracket is removable and will fit almost any tablet or smartphone, although it needs to be slightly off-center on most smartphones to prevent the clips on the front from covering the camera. The $499 Face Camera Pro is a depth sensor that uses infrared structured light scanning technology to capture depth. To capture color textures, it uses the camera on the phone or tablet. This approach is similar to the $379 Structure Sensor for iPad which I have reviewed before. 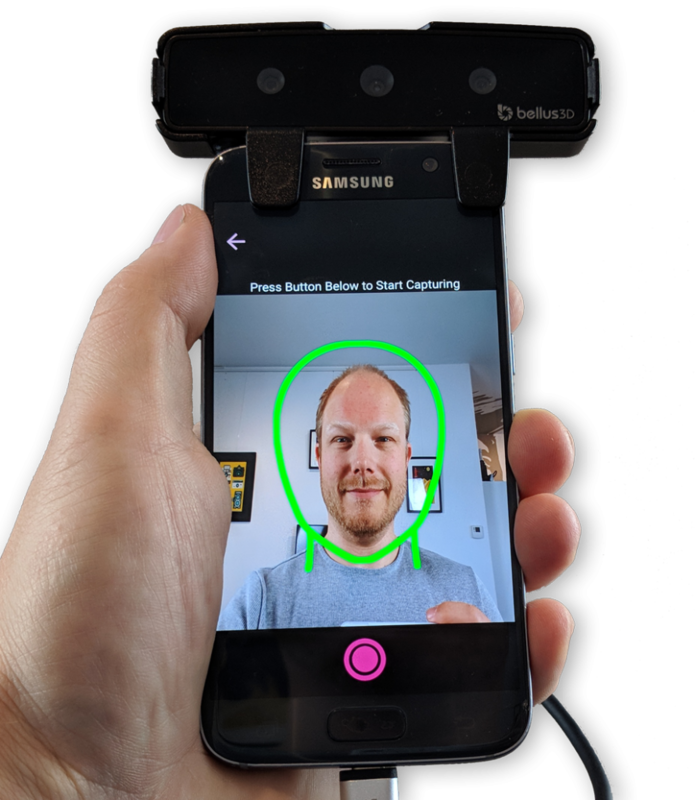 But while the Structure Sensor can can both people, objects and environments, the Face Camera Pro (that can be mounted both away and towards the user) is strictly limited to scanning human faces (including ears). But for that specific purpose, the software settings are highly optimized. The Face Scanner Pro has a USB-C connector but an adapter to micro-USB is provided for older devices. It’s nice that the device is also USB-powered, so you don’t have to charge it separately like the Structure Sensor. Powering the sensor and processing the 3D data will drain your device’s battery faster than usual and you can’t charge the device with the sensor connected so you’ll have to account for this if you plan to scan many faces. It’s good to know that the Face Camera Pro captures 500,000 data points versus 250,000 on the iPhone X built-in depth sensor. So for professional use cases that demand a high amount of detail the add-on device still has a big advantage. The app has just been updated to version 1.5.0 and is now compatible with Android 8.0 Oreo. To be able to use the camera, you have to install both the Bellus3D Service as well as the Face Camera App. I’ve used a Samsung Galaxy S7 smartphone as well as a Huawei MediaPad M3 Lite tablet for this review but also tested it on my Pixel 2 after the update. It worked on all three devices without problems. You can attach a name and email address to each scan for reference, but both will be truncated after the first few characters on smaller smartphone screens without a way to view the full input. You also can’t send the result to the entered email address. 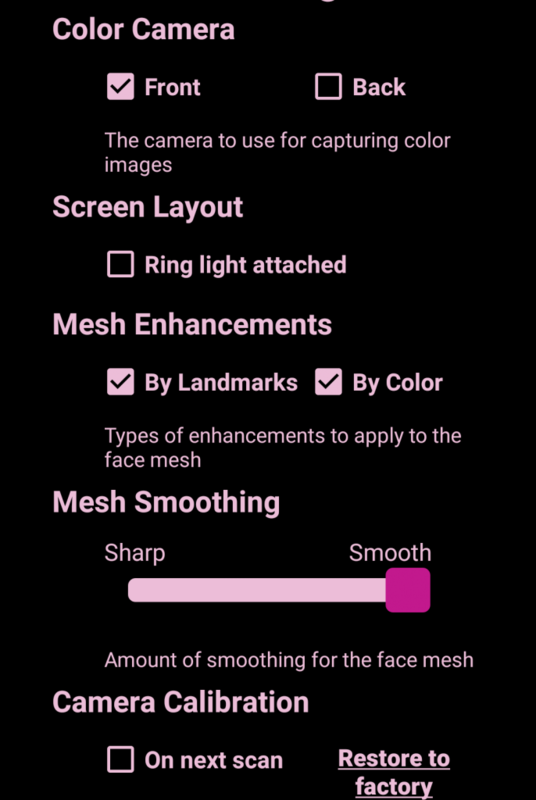 Other than that there are quite a few settings, all optimized for face scanning. I guess all settings are self-explanatory for most people, which makes them even more useful. The “mesh enhancements” do need some explaining but I’ll get into that later. 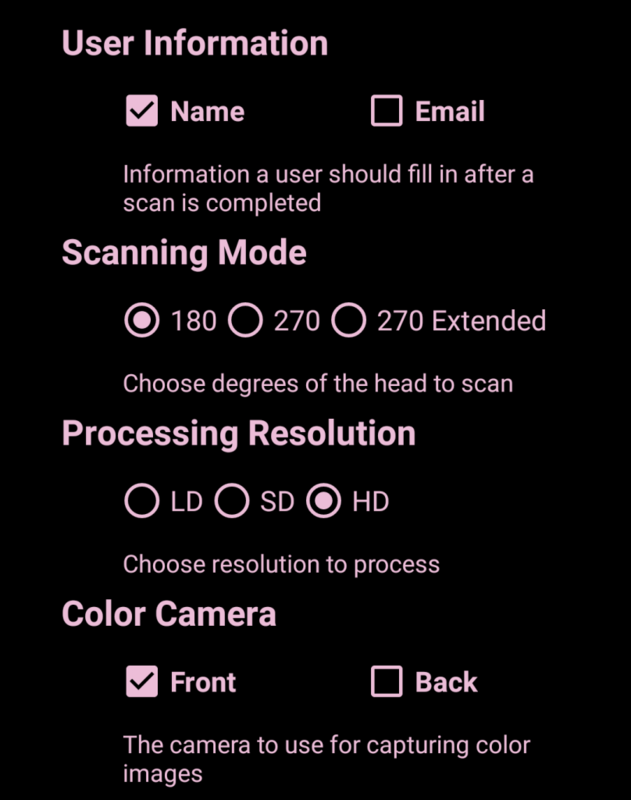 You can tick a box to calibrate the camera on the next scan. This is a fully automatic process and doesn’t require any kind of calibration board. It’s simply done after a normal face scan. And I didn’t really feel it was necessary: Even when switching between devices the textures aligned nicely with the geometry. This is probably because the software uses the detected face landmarks on the geometry to map the texture correctly. In addition to Android 8.0 support, the 1.5.0 update brings detection for bite plates used in dentistry. This shows that Bellus3D’s focus on professional application for the Face Camera Pro. When scanning in a user-facing manner the app will guide the user using voice commands. To make a 3D selfie you’re asked to rotate your head to both sides. Depending on weather you’ve chosen a 180-, 270- or extended 270-degrees scan, you’ll have to rotate your head further. Processing speed will depend on the handset but with my test devices it took about a minute. It’s nice that you can enter the name (and email address if opted to do so) while processing so you won’t waste time. If you flip the sensor around and set the software to use the rear-facing camera, the subject needs to keep still and the device needs to be moved back and forth around the person’s head. The app misses a real time fusion preview that other sensor scanning apps have and instead relies on guiding you with arrows and a progress indicator. It took me a few tries to get used to but then it worked fine. The amount of degrees can only be set to “270 extended” which allows scanning past the ears. Just a bit short of a full 360 rotation. There are a few bugs in this mode, like the voice assistant says you should “keep the head in the oval” but the oval disappears when scanning starts, but it works. At the time of writing there is no export functionality but according to the developer this functionality will be added in 6-8 weeks. Currently you can just connect your device to a computer over USB or use Dropbox and get the 3D file from the Bellus3D system folder which is easy enough. As you can see file is stored as an OBJ with MTL file and JPG texture. A colorless model is also available in STL format. This texture has 2K resolution is wrapped efficiently with the face part undistorted, which makes it easy to edit in photo editing software. Looking at my unwrapped self always make mee feel weird. 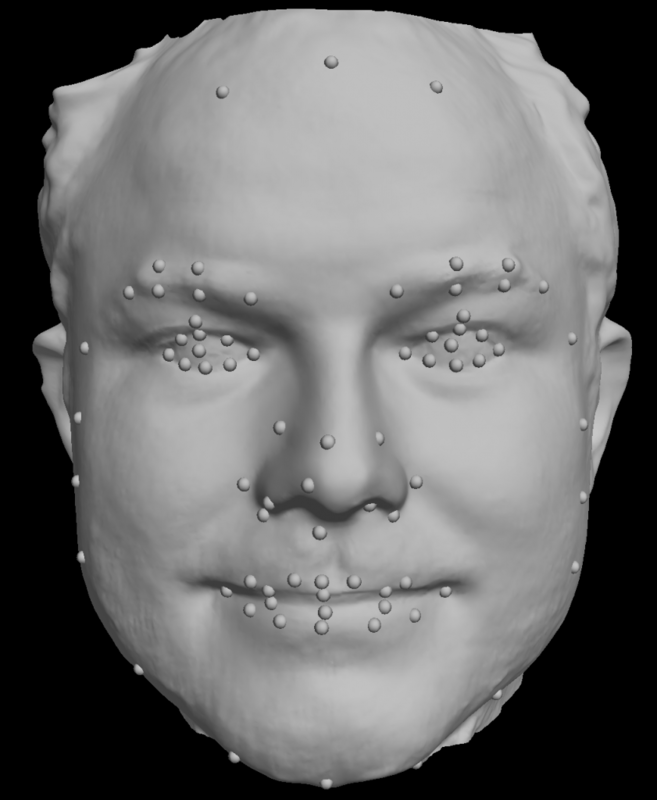 Whats also nice is that the 3D coordinates of the facial features (called landmarks) the software automatically detects are stored as both a separate OBJ file and an XML file. Before diving into the actual results, let me show you what the Mesh Enhancement option, which is on by default, does by showing you the geometry of a model with this feature turned off and on. In the second image, I’ve also enabled the preview of the landmarks but these are also available when Mesh Enhancement is turned off. As you can see, it mainly enhances the geometric appearance of the eyes. It will also enhance the shape of the ears so their geometry doesn’t stretch backwards. It will depend on your use case if this is a useful enhancement so it’s good that it can be turned off. It’s good to realize that this is not captured detail when you compare it to other solutions and it’s on in the results below. That’s even a bit too much texture detail for my comfort level. I’d almost ask for a blurring filter but of course this does show how well the Bellus3D device can capture a human head in both geometry and color. 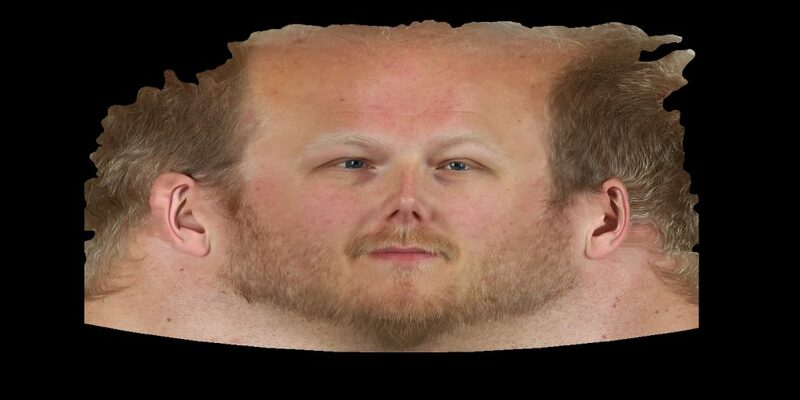 For comparison, below is a 3D selfie I made with the Matter and Form Bevel I reviewed a while ago which is designed for similar purposes. It’s true that at $89 the Bevel is a lot more affordable than the Face Camera Pro but it can’t scan ear-to-ear and what is does scan is of a lot lower quality. It also needs to be calibrated with a calibration board, which is quite a hassle. Here’s another comparison. This time to the Structure Sensor in Combination with itSeez3D. 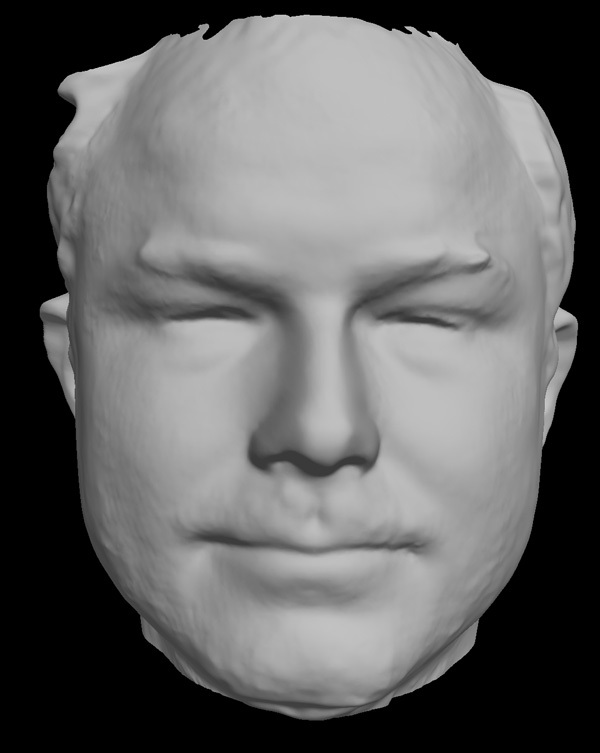 This combo can also scan human busts and even make full body scans but I was interested in how the face details compare in this case. If you look at both models without color, you can see that the Bellus3D device has captured more detail than the Structure Sensor. The mesh is certainly a bit more recognizable than the typical soft geometry you get from most depth sensors. And because of extra detail, the texture is also mapped in a more realistic manner. At $499 the Face Camera Pro is quite expensive for a depth sensor in general, and certainly for one that can only scan faces. 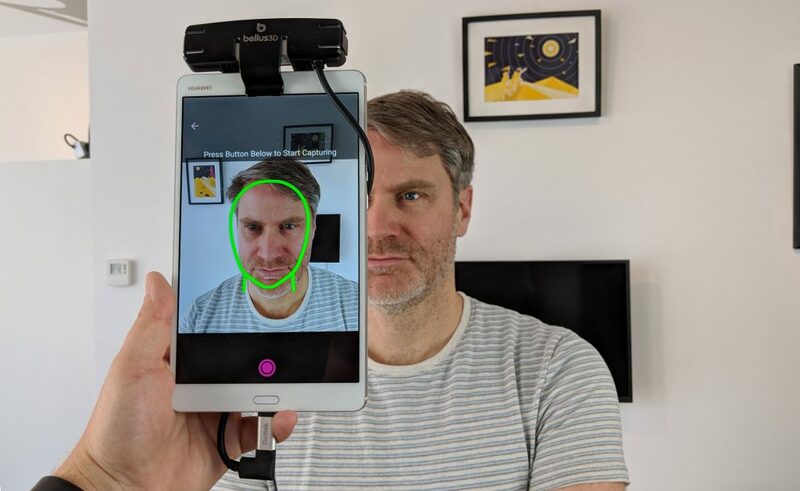 Of course, if you have a professional use case that requires face scanning, this isn’t much of a problem and it does offer a more detailed scans than those from the more all-round Structure Sensor or the built-in sensor on the iPhone X. 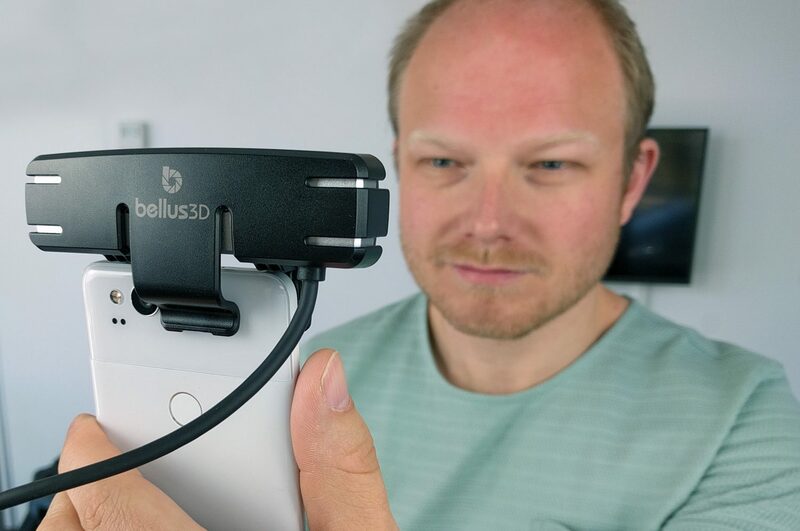 The Bellus3D Face Camera Pro can only scan faces from ear to ear, not full heads with top, back and neck. The device you use it on doesn’t affect geometry quality but it has a huge effect on texture quality. The results of my tests on a Huawei MediaPad M3 and Pixel 2 show significantly better textures than those I made with a Samsung Galaxy S7. For every 3D scanning solution, the software is as important as the hardware. 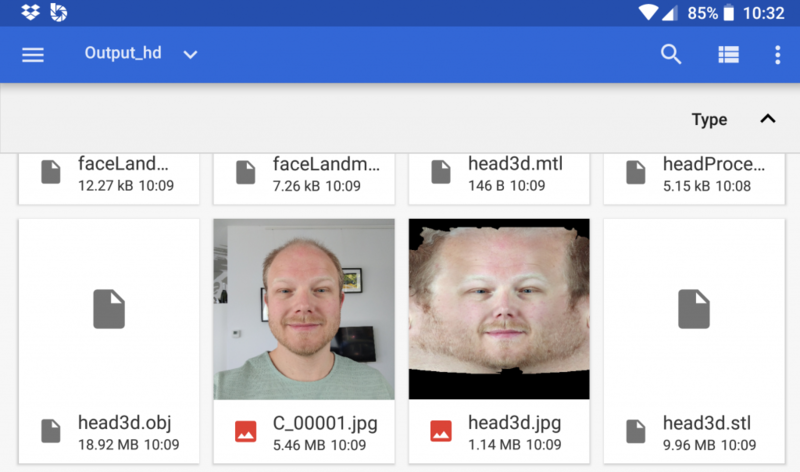 While the Face Camera app still looks basic, it offers the functionality needed to make 3D selfies and browse a scan library. It also has easy to understand quality settings. In my tests, scanning with the front-facing camera to scan myself worked nicely. Using the read-facing camera to scan other people is probably something that most professional use cases like custom eye wear, cosmetic surgery, dentistry would require. The user interface can use some improvements in this mode and it’s a bit less fool-proof than the selfie-mode but it works as advertised nonetheless. It’s nice that it can scan far beyond the ears but it would have been even nice if it could do a complete 360 scan. The app currently lacks any kind of export functionality so you have to get the files through a USB cable or use an Android file manager to access the apps system folder. Export features are coming in a few weeks though, which will make for a more complete user experience. Overall, I really like the concept of a portable depth sensor for Android. I do wish that future software versions will have better rear-facing camera support and also allow full head scanning, or even busts. But for face scanning — both selfies and scanning other people — the Face Camera Pro gives impressive results in minutes. It’s rumored that all future iPhones will have the Face ID feature in 2018 and that it would take until next year before Android handsets will also start featuring active face sensors. If this all comes true it will open a large market for consumer-facing 3D face scanning solutions (no pun intended) and Bellus3D is already well prepared for that. It remains to be seen if and when future built-in depth sensors will offer the resolution of the Face Camera Pro. Until that day this add-on device with higher resolution will probably be preferred for professional use cases. So that’s my review for the stand-alone Android device from Bellus3D. I can’t wait to also test the iOS version that works with the built-in sensor on the iPhone X. If you want to know when that review if live, be sure to follow me on your favorite social network. Update 4 May 2018: This post was updated to add Android 8.0 support information, Pixel 2 examples and information about upcoming updates for file export features. Now, if this could be attached to an Android tablet, and perform environmental scanning, it might be worth the asking price, but just for the novelty use of face scanning, it’s a total rip-off compared to the considerably less expensive Bezel (sorry if calibrating is such a “hassle” for you. I simply stumbled upon your blog and desired to pronounce that I’ve in reality loved surfing your blog posts. After each ill be subscribing for your feed and i reason you write behind extra quickly! Hello, beautiful progress, do you know if is possible to take that info and paste in Dicom language from scanners like CBCT for Maxillofacial studies? After reading your article properly I get useful ideas about the 3D face camera. As camera technology is improving very rapidly this camera is one of the latest types.